The What: Middle Atlantic Products has launched VWM Series Vertical Wall Cabinet, a wall mount cabinet that aims to reimagine equipment mounting for security and AV applications. The What Else: Within its low-profile design, the VWM offers multiple positions for vertical mounting that optimize the cabinet space for the highest density of components of any vertical wall cabinet in the industry, according to the company. These flexible mounting options include fixed and pivoting rackrail in a range of sizes that can be efficiently mounted where needed within the cabinet’s back pan design. 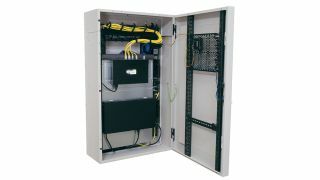 The system also utilizes the company’s Lever Lock tool-free mounting system, providing the flexibility to integrate small devices such as extenders, power supplies, electronic door lock controllers, compact power solutions, and more throughout the cabinet’s back pan or inside the front door. The VWM Series is available in a variety of options to meet the desired level of system security and access. The system can offer access only to the integrator, or it can allow end users to access controls, with some options that will even grant visibility via a plexiglass hinged top. The VWM Series Wall Cabinets come pre-configured with all the options integrators need to build out basic installations in a single box. It is well suited for integrators needing a standard design with no customization and/or requiring an expedited lead-time for projects with tight deadlines. Whether pre-configured or fully customized, the VWM Series is designed to improve thermal management, cable integrity, and power distribution while providing a secure location for components of all sizes in an all-in-one system. The Bottom Line: The VWM Series is a high-capacity, versatile solution, providing vertical mounting of deep equipment as well as small devices—all in one unit. Available in pre-configured models or customizable to exact system specifications through the company’s online design experience, the VWM Series utilizes a patent-pending modular systems approach to equipment mounting, providing unmatched configurability and systems reliability.